I have just recently done a 11 hour long-haul airplane flight, which was so uncomfortable for my back. It got me thinking about an exercise and stretch routine to do on a plane flight. I usually get up and move about on the long-haul flights, but this time I had to sit in the middle row and did not have an aisle seat. This meant I didn’t get up as much to walk and stretch in the back of the plane. So I went hunting on the internet to see if I could find any tips or videos to show me an exercise and stretch routine I could practice on my next airline trip, which happens to be in a weeks time. I think I have found some really cool stretch videos both for those in a cramped seat and those lucky enough to have lots of leg room up the front of the plane. I thought I’d also include my personal 10 tips to make a flight that little bit better. This video is good for basic moves to do whilst sitting in your economy or coach seat on the plane. I think some moves like the triceps muscle stretch would be hard to do with someone sitting next to you unless your very flexible like this yoga instructor. I also do other things to try make my flight experience as comfortable as possible for me. Here are 10 of the things I like to try do to help me feel that little bit more comfortable on a plane trip. To start you will need a compact flight bag like mine below. 1. Flight Socks – Even though I’m 31 years old, I don’t have a heart condition or problems with my circulation I still wear compression stockings. Flight socks can help reduce your risk of a deep vein thrombosis from sitting too long, swelling in your ankles and, I feel, general leg irritability. 2. Ear Plugs – You used to get soft ear plugs to cut out the airplane noise with an economy seat, but I haven’t got them free for a long time now. It is amazing how peaceful it can be not hearing that constant cabin white noise type sound. I wouldn’t get any sleep without my ear plugs. 3. Inflatable Neck Cushion – I’m a tall guy at 6′ foot 3″ inches so my head is typically above the head rest. My blow up in-flight neck cushion saves me a neck pain from my head bobbing about unsupported sitting in an upright position. 4. Eye Cover – Airlines at least still seem to give you an eye cover with the economy seats plane pack. I carry one in my flight bag just in case as well. If I don’t block out the light on the plane like the built-in TV and other passengers reading lights I just can’t sleep. 5. My Own Headphones – If you haven’t tried out listening to the on-flight entertainment through your own ipod headphones, you’ve got to. They are much better instead of those free plane ones. The sound is so much louder and clearer quality through your own headphones. The only problem is I have to listen with the volume near zero and when the cabin crew speak on the intercom it is super loud and I need to take them out till they have finished speaking. 6. Move the Magazines – Again cos I’m tall the first thing I do before I sit down is move all the back of the seat reading in front of me and place it in the overhead locker. Saving a few cm’s in leg room space makes a massive difference on a long haul flight. 7. Watch What I Eat – All the airline hostesses I have talked to over the years have all said to watch what you eat on a plane. I find I don’t need an alcoholic drink to relax usually, but if I do I have a red wine with water. No tea or coffee for me and I have started cutting out the desserts and rolls on the plane to minimise meals with sugar and not much fibre. This could help with the bloating and gas problem. 8. Wait To Board the Plane – Personally, I don’t want to wait in a long queue at the boarding desk and then end up waiting for a long time sitting in a very tight economy seat for all passengers to board the plane. I’ll rather wait at the boarding gate area to see when the line of people has calmed down and then board the plane. It gives some time to stretch before boarding as well. 9. Soft Clothing and Shoes – Being able to squirm in a small seat needs comfortable clothing. I’m sure you take your shoes off to let your feet feel less bulky. Especially if you have a UK size 12 shoe it will irritate you by getting stuck underneath the seat in front of you. It will also limit the amount of space to stretch your legs underneath the seat. 10. My Other Airplane Exercises and Stretches – When get up for drink I also like to do calf raises, ankle rolls, quad stretching, calves stretching, groin adductor stretches, standing figure of four stretch, hip hinge, and abdominal massage. 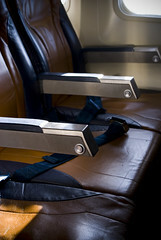 What are some of your favourite things to do to make your flight a more comfortable journey? Do you have some moves that make you feel better on a plane? Let me know in a comment below.